Winners of the Pole position for the Indianapolis 500. The pole position is the first starting position on the grid, situated on the inside of the front row, and is held in high prestige at Indianapolis. Due to the nature of qualifying for the Indianapolis 500, the pole-sitter is currently determined seven days before the race (and in past years as many as 15 days prior). As a result, the pole-winning driver and team receives considerable pre-race attention and accolades in the days leading up to the race. In most circumstances, but not necessarily, the pole-sitter is the fastest car in the field, and thus one of the pre-race favorites to win the race. Ed Carpenter won the pole position in 2013, 2014, and 2018. Verizon currently sponsors a $100,000 award given to the pole winner. Rick Mears holds the all-time record with six career pole positions. Ten drivers have won the pole position in two consecutive years, but no driver has ever won three years in a row. The Indianapolis 500 has been won from the pole position a total of twenty times (out of 102). Since the first Indianapolis 500 in 1911, all cars have been required to qualify for the race. This had been by means of a speed/time trial out on the race course. Since 1939, the starting grid (including the "pole position") has been determined utilizing four-lap (10-mile) qualification runs. Each qualification run is performed with no other cars on the track. This format differs from traditional road racing and NASCAR qualifying, in which multiple cars are on the track simultaneously in an "group" or "open" qualifying session. It also differs from most other oval races in which qualifying speed is based on a single hot lap. The theory is that each car could give its best performance if there were no other vehicles on the track to impede them. Ironically in modern times, cars can actually run faster with other cars on the track due to drafting. Nearly every unofficial practice speed record has been achieved by exploiting another car's slipstream, referred to colloquially as receiving a "tow.". Starting roughly around the 1960s, electric eyes, and in the 1980s radar guns, were used to measure trap speeds at select locations, namely at the end of the long straightaways, in an effort to determine the cars' top speeds. Since the early 1990s, sophisticated electronic scoring devices have been installed at the track and inside the cars to measure additional trap speeds (straightaways, turns, etc.). However, the official scoring only reflects the time and speed at the start/finish line. All other measurements are unofficial. In 1911, the starting grid was determined by the order that entries were received by mail. To qualify for the race, entries had to average 75 miles per hour (121 km/h) or faster along a "flying" quarter-mile measured segment of the track. Each cars was given three attempts, and speeds were not recorded - only pass/fail. In 1912, all cars were required to complete one timed lap (2.5 miles) at a minimum speed, but the grid order was still determined by the order the entries were received. For 1913 and 1914, all cars completed one timed lap at a minimum speed. Overseas competitors voiced complaints about their entries arriving in the mail later than local entrants, and thus unfairly starting deep in the grid. A compromise was made such that the grid was determined by a blind draw a few days before the race. Starting in 1915, for the first time, the grid order was set by qualifying speed. Though multiple days were allotted for qualifying (often referred to as "elimination trials"), drivers were known to wait until the last minute to qualify. Even though the track would normally be made available for practice beginning on May 1, many teams chose not to even arrive until just before elimination trials. The Speedway reacted by setting up a slightly retooled format in 1916 such that the first day qualifiers lined up first in the grid by speed. The second day qualifiers would line up behind the first day qualifiers, and so on, regardless if drivers on subsequent days were faster than the first day qualifiers. This encouraged drivers to qualify earlier rather than "last minute." This general grid alignment rule was used through the 2000s, and (excluding 1911-1914), sixteen times the pole winner was not the overall fastest car in the field. One-lap qualifying speeds were used for 1915, 1916, and 1919. From 1920 to 1933, the grid was set using four-lap (10-mile) qualifying runs. From 1934 to 1938, the grid was set using ten-lap (25-mile) qualifying runs. In 1939, they reverted to four-lap runs, and that is still in use today. The term "pole position" is believed to have derived from horse racing. Despite some common misconception, is not so named from the iconic pylon "pole" scoring tower at the track. The pole position traditionally (and weather permitting) has been determined on the first day of time trials, nicknamed "Pole Day." The final day of time trials has been nicknamed "Bump Day" or "Bubble Day." When the field is filled to 33 cars, the slowest car in the field is said to be "on the bubble." Additional drivers may attempt to qualify faster and bump their way into the field. The driver is said to have 'bust the other driver's bubble.' Since 2014, the use of these two terms has diminished due to a revamped qualifying format (see below). Pole position qualifying, generally referred to as "Pole Day," is currently held the weekend prior to the race. Two days of qualifying are scheduled in total, the Saturday and Sunday before the race. Since 2010, the pole winner has been determined by a special "shootout" session amongst the nine fastest qualifiers. Springtime rain in the midwest is often a factor, and over the years, many days of qualifying have been delayed, ended early, or completely washed out due to rain. If pole day is rained out, it is moved to the next qualifying day scheduled. This happened most recently in 2006 and 2015. In 2006 (when four days were scheduled), the first two days of qualifying were rained out and pole position qualifying ended up being held on the third day, followed by what remained the fourth and final day. In 2015 (when two days were scheduled), the first day of time trials was washed out, and all time trials was held on the second and final day. In the years when there were four days of time trials, if the second or third day of qualifying were to be rained out, neither would be made up (for example, this happened in 1980). If the final day of time trials ("Bump Day") was rained out, it would not be made up if the field had already filled to 33 cars (for example, this happened in 1984). If Bump Day were to be rained out, and the field was not filled to 33 cars yet, a special session would be held Monday (to date, this has occurred only once, in 1968). The schedule for time trials (referred to at the time as "elimination trials") varied over the years. The number of days varied from three to as many as eight. In many cases, qualifying began the Saturday-Sunday before the race, and continued through the week for a few days, and ended usually two days before the race. The day before the race would be normally reserved for track cleaning, and final "carburation tests." It was standard procedure for qualifying to generally run each day until sundown. After WWII, the Speedway management began to standardize the qualifying schedule. For a few years, six days (three weekends) of qualifying were held. Starting in 1952, it was reduced to four days (two weekends). The pole position would be settled on the first day, now nicknamed "Pole Day." In addition, the closing time for the track was eventually set at 6:00 p.m. local time. In previous decades, the track generally closed at sundown. In 1974 only, as a gesture to the ongoing energy crisis, qualifying was reduced to two days – the Saturday two weeks before the race, and the Saturday one week before the race. Both of those two days were divided into two sessions (an "early" period and a "late" period) mimicking the traditional four 'days.' Rain hampered both days, however, and the "four periods" plan was rendered incomplete. The two-day schedule lasted only one year, and in 1975, the Speedway reverted to four days. Since the race itself was not fixed on the weekend until the early 1970s, it was not uncommon prior to then for the final weekend of time trials to occur only a couple days before the race itself (if Memorial Day fell on a weekday early in the week). From 1998 to 2000, an experimental two-week "compressed" schedule was adopted for the Indy 500. Time trials was reduced to only two days of qualifying, the Saturday & Sunday one weekend before the race. "Pole day" would be held Saturday, and "Bump day" would be held Sunday. This was an effort to reduce costs, and maximize crowds. The middle two days of qualifying had long suffered from dwindling attendance, participation, and interest. From 2001 to 2004, the schedule was expanded to three days of qualifying, the Saturday and Sunday two weekends before the race, and the Sunday one week before the race. The additional day allowed make-up time in case of rain, and stretched the month back to the traditional three weekends. The Saturday immediately before Bump Day was reverted to a regular practice day, and for a short time, the Freedom 100 was scheduled for that afternoon. The arrangement received mixed reviews, and was eventually scrapped. Time trials reverted to four days (two weekends). The procedure also changed (see 11/11/11 below). The Freedom 100, which was on the second Saturday, was moved permanently to Carb Day later in the month. The Speedway reinstated the two-week "compressed" schedule, similar to the plan used in 1998–2000. Time trials is scheduled for two days: the Saturday & Sunday one weekend before the race. From 2010 through 2013, "Pole Day" is held Saturday, and "Bump Day" is held Sunday. The track opens for practice the weekend before time trials. Starting in 2014, the two-day qualifying schedule was kept intact, but the procedure was changed such that the pole position winner is not actually determined until Sunday. On a given day of qualifying, the track is open for qualifications from 11 a.m. (or 12 noon) to 6 p.m. local time. If there are no cars in line to make an attempt, the track is opened for general practice, or (briefly) closed for routine safety inspection. The busiest periods of qualifying, due to ambient and track temperatures, are the first hour and the final hour. Due to the lower temperatures and shadows cast along the track it is common for drivers to wait until late in the day to make their attempts. The car must be moving out of the pits before the 6 o'clock gun for the attempt to count. Each driver is allowed two warm-up laps before taking the green flag to start the run. Prior to WWII, it is believed that drivers were generally allowed an unlimited number of warm up laps, and could start their run whenever they deemed themselves ready. From 1946 through 1981, drivers were allowed three warm up laps. In 1982, it was reduced to two warm-up laps, however, officials can allow three once again if they determine that the track temperatures are below a certain threshold, and three laps are necessary to build sufficient tire temperatures. As the driver is coming around to start the qualifying attempt, a crew member(s) is stationed at the head of the main stretch and waves a green flag to signify they want to start the run. If he waves a yellow flag, or waves no flag, the run does not start, and an attempt is not counted. At any time prior to completing the four-lap run, the crew can "wave off" the run by holding up the yellow flag. Likewise the driver can pull off the track at any time to abort the run. Prior to 1974, the decision to start the run was actually made by the driver, who would signal the officials by raising his hand in the air. For safety purposes, due to increasing speeds, the increasingly tight confines of the cockpits, and the fact that crews are now in constant contact with drivers through two-radio communication, the hand signals were eliminated. During the USAC era, the traditional qualifying procedure went largely unchanged although it may appear complicated to the casual observer. Pole day was considered the most significant, popular, and busiest of the speed trial period, while the other three days were more often leisurely and sometimes uneventful. The evening before pole day time trials, a blind draw is used to establish the qualifying order. Prior to 1965, no draw was used, and the qualifying order was a "first-come, first-served" line-up, queued down the pit lane and usually stretching into the garage area. Some teams would even claim their spots in line the night before. The unorganized scramble to roll the cars into a queue had often led to heated exchanges, collisions, and unfair situations. In 1971, the rules were further clarified to guarantee every car in the original qualifying draw at least one attempt to qualify in the pole position round, regardless if weather or other circumstances interfered. One at a time, cars ran a four-lap qualifying attempt to post qualifying speed. Despite the popular commonplace of reporting qualifying speed, officially, the qualifying results are scored by elapsed time. Each car had three attempts to post a qualifying time and whenever the four laps were completed the time was "locked in". During the run, if a driver/team felt their speed was not to their satisfaction, they could wave off that run at any time before completing the fourth lap. The wave off was accomplished either by the driver pulling into the pits, or by a crew member waving a yellow flag, and one attempt would be charged to the car. Each car was allowed three total attempts. Once the run was completed, the qualifying time was locked-in. If the team decided the locked-in time was insufficient, the car would have to be withdrawn, and could not be re-qualified. Another car would have to be used to make a new attempt. In most cases, teams usually would wait until their car was bumped rather than preemptively withdrawing, as the risk-reward was usually considered high. The fastest qualifier on Pole day won the pole position. The pole day qualifiers were lined up by speed rank. There was no set number of qualifiers for pole day, and the total widely varied by year - ranging from as few as 11 in 1987 to as many as 33 in 1999 - for a number of factors (e.g., weather conditions, crashes, mechanical problems, injuries, or simply by choice). Cars that qualified on the second day lined up by speed behind the pole day qualifiers, followed by the third day qualifiers, and finally, the fourth day qualifiers, until the field filled to 33. This grid arrangement (based on speed rank on each day) usually dictated that the entire grid would not be arranged by speed from top-to-bottom in exact order. In fact, only one time during this period (1969), did the grid happen to be aligned exactly by speed from 1st to 33rd (and that was aided by the fact that two days of time trials had been rained out). It never occurred when four full days of time trials were observed. Once the field was filled to 33 cars, bumping would begin. The slowest car in the field, regardless of the day it was qualified, was "on the bubble." If a driver went out and qualified faster, the bubble car would be bumped, and the new qualifier would be added to the field. The bumped car would be removed from the grid, and all cars that were behind him would move up a spot. The new driver would take his position according to his speed rank on the day he qualified (typically the final day). This procedure would be repeated until the track closed at 6 p.m. on the final day of qualifying. Bumped cars could not be re-qualified. A bumped driver would have to secure a back-up car (assuming it had attempts left on it) in order to bump his way back into the field. Starting 2005, although due to rain it was not observed fully until 2007, the qualifying procedure was altered. The 33-car field would be split into three parts. On the fourth day of qualifying (bump day)- bumping begins immediately as the slowest car overall is "on the bubble," in danger of being bumped out by the next qualifier; all cars behind those bumped out are immediately slotted up one position regardless of their day of qualification, but no fourth-day qualifier is slotted ahead of first-, second- or third-day qualifiers still remaining in the field. This procedure is commonly referred to as "11/11/11" since eleven cars would qualify on each of the first three days. Two other major rule changes were introduced alongside this format. Drivers were now allowed three qualifying attempts in a car per day. Previously each car was only allowed three attempts during the entire month, and once an attempt had been completed, it was locked-in. Cars that were bumped could be re-qualified (provided they still had attempts left), and likewise drivers could withdraw an already-qualified car and re-qualify it (provided it still had attempts left). In both cases, the new rules permitting multiple attempts per day allowed drivers more opportunities to put in their fastest possible speeds. Allowing bumped cars to re-qualify also alleviated the issue regarding the shortage of chassis that had become somewhat problematic during that time. Speedway management had toyed with the idea going back as far as 1987, and seriously considered it around 1990. It was offered as an idea to generate excitement into the normally sparse second and third qualifying days. It was not adopted until 2005, and after mixed results, was scrapped after 2009. A new format was introduced, adding an element similar to "knockout qualifying" systems used in World Superbike, Formula One, as well as IndyCar road course races. Cash prizes for the front row were increased, and championship points were now awarded for Indianapolis 500 qualifying results for all positions. Pole Day (Saturday) opens at 11:00 am. All cars are permitted to make up to three attempts, time permitting, until the session closes at 4:00 pm. A total of 24 positions are available to fill, and bumping begins as soon as the field fills to 24 cars. At 4:00 pm, positions 10-24 are locked in for the day. Positions 1-9 advance to the Fast Nine Shootout. At 4:30 pm, the Fast Nine Shootout begins, and runs until 6:00 pm. Each of the nine cars has their afternoon times erased, and now re-qualifies to determine the pole position as well as positions 2-9. Each car is allowed up to three attempts during the shootout, time permitting. On Bump Day (Sunday), the remaining positions 25-33 were open for any remaining entries. Bumping begins as soon as the field fills to 33 cars. The slowest car in the field, regardless of the day the car qualified, is on the bubble. Fast Nine Competitors from Saturday, however, were protected, and could not be bumped. On two occasions, (2011 and 2013), rain delayed the start of the shootout session. In each of those cases, the nine participants were allowed only one attempt during the shootout session. On the first day of time trials (Saturday), all cars entered make an attempt to qualify. Qualifying is scheduled from 11:00 am to 5:50 pm. The fastest 30 cars are locked into the starting field. Starting positions, however, are not assigned. The top nine cars from Saturday qualify for the Fast Nine Shootout. Each car and driver is allowed three attempts on Saturday, similar to the 11/11/11 and 24/9 procedures, a time for an already qualified car can be withdrawn and the car can be re-qualified in search of a faster speed. If there are 33 cars or fewer, then all 33 cars will be locked in. On the second day of time trials (Sunday), the cars that posted times from 10th to 30th will each make a qualifying attempt. Saturday times will be erased, and the Sunday times will determine the starting lineup. If there are 33 cars or fewer, then cars that posted times from 10th to 33rd will all participate in the session. Except in 2018, if 34 or more cars made an attempt Saturday, then cars posting times 31st and lower will participate in the second phase of qualifying, sometimes nicknamed the "Last Row Shootout." Saturday times will be erased, and each car will make one attempt. At the end of the session, the top three cars start in positions in 31–33. Teams not currently in the top three of the session can make multiple attempts within the time limit to bump themselves back in the field. As of 2017 this session has only been required once, in 2015 when there were 34 entries. Later in the afternoon on Sunday, the top nine cars from Saturday participate in the Fast Nine Shootout to determine the pole position as well as starting positions 2–9. Due to inclement weather on Saturday, qualifying for 2015 was to be retooled into a one-day format, mimicking the format from 2014. However, after a major crash during the Sunday morning practice session, qualifying was further delayed, and the two-round format and Fast Nine Shootout were cancelled. Each car was given only one attempt to qualify, and positions 1–30 were locked in. In the final hour, a 45-minute last row "shootout" was held to determine positions 31–33. The system was modified in 2019 after popular driver James Hinchcliffe was bumped in Saturday qualifying, and unlike former formats, there was no Last Row Shootout on the second day. In response, INDYCAR made modifications to the system. On the first day, teams are not limited to three attempts. Starting positions are assigned for those that finish 10th to 30th. The top nine continue to use the Fast Nine Shootout. On the second day, teams that did not qualify participate in the Last Row Shootout will make one attempt to make the field. The top three cars start in positions 31-33. After the Last Row Shootout, the Fast Nine Shootout continues. Sixty-five drivers have qualified for the pole position, one less than the number of race winners. Lewis Strang No full lap 29 The grid was arranged by the order that entries were received via U.S. mail. Gil Andersen 80.93 130.24 16 Single lap qualifying; David L. Bruce-Brown (88.45 mph – New track record) was the fastest qualifier. The grid was arranged by the order that entries were received via U.S. mail. Caleb Bragg 87.34 140.56 15 Single-lap; Jack Tower (88.23 mph) was the fastest qualifier. The grid was arranged by a pre-race blind draw. Jean Chassagne 88.31 142.12 29 Single-lap; Georges Boillot (99.86 mph – New track record) was the fastest qualifier. The grid was arranged by a pre-race blind draw. Russ Snowberger 112.796 181.528 5 Billy Arnold initially sat on the pole, but was disqualified for having his brakes disconnected. Later on, Arnold qualified at 116.080 mph and was the fastest qualifier (started 18th). Rex Mays 120.736 194.306 17 Ten-lap average; Kelly Petillo (121.687 mph) qualified for the pole, but was disqualified for using 5/8 pint too much fuel. Mays was elevated to the pole. Cliff Bergere 126.471 203.535 16 Ralph Hepburn (133.944 mph – New track record) was the fastest qualifier, and started 19th. Duke Nalon 136.498 219.672 10 New track record; on the second weekend of time trials, Walt Faulkner (136.872 mph) broke Nalon's one-week-old track record, and became the fastest qualifier. He started 14th. Fred Agabashian 138.010 222.106 27 New track record; on the second weekend of time trials, Chet Miller (139.034 mph) broke Agabashian's one-week-old track record, and became the fastest qualifier. He started 27th. Jerry Hoyt 140.045 225.381 31 Jack McGrath (142.580 mph) was the fastest qualifier, and started 3rd. Most cars stayed off the track on pole day due to gusting winds, and threatening rain. Near the end of the day, two cars completed attempts and took the top two spots. Hoyt's pole-winning speed was only the 8th-fastest overall in the field, the record slowest ranked pole speed. Eddie Sachs 146.592 235.917 21 New track record; On the second weekend of time trials, Jim Hurtubise (149.601 mph) broke Sachs' one-week-old track record, and became the fastest overall qualifier. He would start 23rd. Johnny Rutherford 198.413 319.315 9 New track record; Rutherford's third lap of 199.071 mph was a single-lap track record, and just 0.21 seconds shy of the elusive 200 mph barrier. Johnny Rutherford 188.957 304.097 1 Mario Andretti (189.404 mph) who qualified on the second weekend of time trials, was the fastest overall qualifier, and started 19th. Tom Sneva 198.884 320.073 2 New track record; entire track resurfaced in asphalt prior to the race; Sneva's first two laps of 200.401 and 200.535 marked the first-ever official laps over 200 mph (320 km/h) at Indianapolis. Bobby Unser 200.546 322.748 1 Rain stretched the pole qualifying round over three days. After the initial qualifying line was passed through, Unser was awarded the pole. Moments later, Tom Sneva (200.691 mph) became the overall fastest qualifier, but since he was officially a "third day" qualifier, started 20th. Teo Fabi 207.395 333.770 26 New track record; Pop-off valves limiting boost to 47 inHG. The first weekend of time trials was rained out, and pole qualifying was held on the third day of time trials. Mario Andretti† 215.390 346.637 9 Radial tires introduced. Many teams stayed off the track due to windy conditions and handling problems, and only 11 cars qualified on pole day. Rick Mears 223.885 360.308 23 New track record; entire track resurfaced in asphalt prior to the race. Pole day (Sat.) was rained out, and pole qualifying was held on Sunday, the second day of time trials. Roberto Guerrero 232.482 374.144 33 New track record. Crashed on parade lap, ending his day before the race started. Tony Stewart* 233.100 375.138 24 New track record; entire track resurfaced in asphalt prior to the race; Arie Luyendyk (236.986 mph) who was a second day qualifier, was the fastest qualifier, and started 20th. He set the current an all-time 1-lap track record (237.498 mph) and 4-lap track record. Hélio Castroneves 227.970 367.809 9 New two-stage qualifying session used. Alex Tagliani 227.472 366.081 28 One attempt permitted in Q2 because of rain. Ed Carpenter 228.762 368.156 10 ECU-limited boost of 140 kPA for qualifying only; Rain delayed qualifying where Q1 ended at 6 PM; Q2 started at 6:30 and one attempt permitted. Ed Carpenter 231.067 371.866 27 Q1 held on first day; Q2 held on second day of qualifying. Scott Dixon 226.760 364.935 4 Because of weather and other incidents during qualifying day warmup, Q2 was not held. James Hinchcliffe 230.760 371.371 7 Q1 held on first day; Q2 held on second day of qualifying. 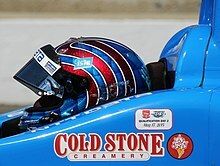 Scott Dixon 232.164 373.632 32 Q1 held on first day; Q2 held on second day of qualifying. Ed Carpenter 229.618 369.534 2 Q1 held on first day (approximately 4.5 hour rain delay); Q2 held on second day of qualifying. 1935: Billy Arnold qualified at 121.687 mph (10-lap qualifying runs) to win the pole position. In post-inspection, it was determined he used too much fuel. Rules allowed drivers to use 3 gallons of fuel maximum for the run, with a margin of error of 1 pint. It was measured that he used ​5⁄8 pint over, and he was disqualified. Rex Mays, the second-fastest qualifier, was elevated to the pole position. 1996: At the conclusion of pole day qualifying, Scott Brayton qualified for the pole-position, Arie Luyendyk qualified second, and Tony Stewart qualified third. Officially it was Brayton's second consecutive Indy pole (1995–1996). One hour and forty-five minutes after qualifying was over, Luyendyk was disqualified for his car being 7 pounds underweight. Stewart was elevated to second position. The following day, Luyendyk qualified with the fastest speed overall, but as a second day qualifier, was required to line up behind the first day qualifiers. Five days later, Brayton was killed in a practice session accident while driving a back-up car. His primary car was taken over by Danny Ongais, but rules required a substitute driver to move to the rear of the field. Thus, Stewart was elevated to the pole position for race day. Eighteen drivers have qualified for the pole position more than once, accounting for 49 pole positions out of 98 races, 51.02%. * Scott Brayton qualified for the pole position in 1996, but was killed in a practice session accident with a back-up car six days later. Tony Stewart, the second-place qualifier, subsequently moved onto the pole position, while Brayton's car, thereafter assigned to Danny Ongais to drive, was, by rule in driver-replacement situations, moved to the last starting position. Qualification for the pole-position in consecutive races has been accomplished eleven times; start from the pole position will have occurred ten times (pending 2014 race). No driver has qualified for three consecutive pole positions. Eighteen drivers have won the Indianapolis 500-Mile Race from the pole position in twenty-one out of ninety-three races, 22.58%. Two consecutive wins from the pole position has occurred twice, in years 1922–1923 and 2008–2009, and three consecutive wins once, in years 1979–1981. Rick Mears 1979 1988 1991 First three-time winner from the pole position; accounts for three of Mears' four career wins. Johnny Rutherford 1976 1980 First multiple-winner from the pole position. Accounts for two of Rutherford's three career victories. Tommy Milton 1923 First year with consecutive wins from the pole position; accounts for one of Milton's two career victories. Note: Arie Luyendyk's record-setting time trials run was conducted on the second day of time trials in 1996. Therefore, due to the rules at the time, he was ineligible for the pole position. He lined up 20th on the starting grid. ^ The Talk of Gasoline Alley. May 17, 2011. WFNI. ^ "Drawing Will Decide Qualifying Positions". The Indianapolis Star. May 14, 1965. p. 26. Retrieved April 5, 2019 – via Newspapers.com. ^ Marquette, Ray (May 15, 1971). "Donohue Set For Pole Record". The Indianapolis Star. p. 1. Retrieved April 5, 2019 – via Newspapers.com. ^ Cavin, Curt (2010-04-10). "Winning pole just got more intense". IndyStar.com. Archived from the original on March 11, 2014. Retrieved 2010-04-11. ^ Kelly, Paul (2010-04-14). "'Fast Nine' To Make Thrilling Late-Day Run For Pole Saturday, May 22". Indy500.com. Archived from the original on March 11, 2014. Retrieved 2010-04-14. ^ Patton, W. Blaine (May 19, 1935). "Mays in pole post as pilot is disqualified". The Indianapolis Star. p. 1. Retrieved April 17, 2017 – via Newspapers.com.